The Curating Conflict workshop emerges from the practical challenges museums, galleries and cultural institutions face when specifically representing experiences of conflict. By bringing together leading experts and researchers from England, Northern Ireland and Republic of Ireland, the workshop is an opportunity to gain insights from individuals and institutions involved in producing and assessing commemorative practices through collecting, curating and researching the representation of conflict in such public spaces where historical significance is constructed, transmitted and contested. The panels consist of museum experts from Royal Armouries (England), Ulster University, Teeside University, National Museums Northern Ireland, National Museum of Ireland and National Gallery of Ireland to discuss how museums can affectively deal with the pluralist history of conflict on public platforms. This workshop will be of particular interest to museum professionals, practitioners, researchers and students. It is an open forum and an opportunity for attendees to participate in intercultural exchange, active learning and sharing of best practices with experienced museum professionals and researchers. This panel will assess the challenges facing curators through reflecting on their curatorial experience. Henry Yallop (Keeper of Armour and Edged Weapons, Royal Armouries, England). Dr. Sandra Heise (Curator, National Museum of Ireland). Hannah Crowdy (Head of Curatorial, National Museums Northern Ireland). This panel will discuss the relationship between conflict and materiality and how exhibition displays can be used to connect visitors to the sensory and emotional aspects of conflict. Prof. Elizabeth Crooke (Professor of Museum Studies, Ulster University). Lisa Traynor (Curator of Firearms, Royal Armouries, England). Lar Joye (Port Heritage Director, Dublin Port). Commemorative exhibitions must address a wide range of visitors. This panel will explore visitor engagement in the exhibition design process and the function of exhibitions in contemporary commemorative contexts. Dr. Roisín Higgins (Senior Lecturer in History, Teeside University). Dr. Brendan Rooney (Head Curator, National Gallery of Ireland). The workshop will take place in Room RD005 in Rathdown House on DIT’s new Grangegorman Campus where the Dublin School of Creative Arts is located. The campus itself enjoys a close proximity to the center of Dublin being around 1km from O’Connell Street, the city’s main thoroughfare. It is easily accessible by foot, bicycle, and public transport. The campus is well-served by public transport. 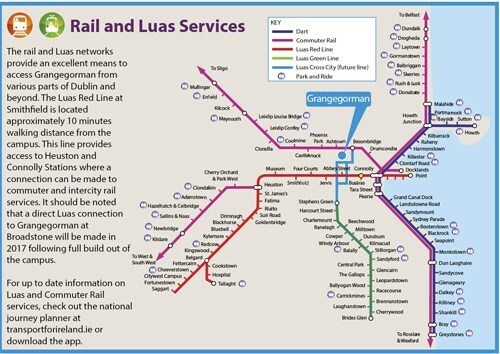 The city’s light railway service (LUAS) has a stop at Grangegorman on the Green Line which is across from the campus. 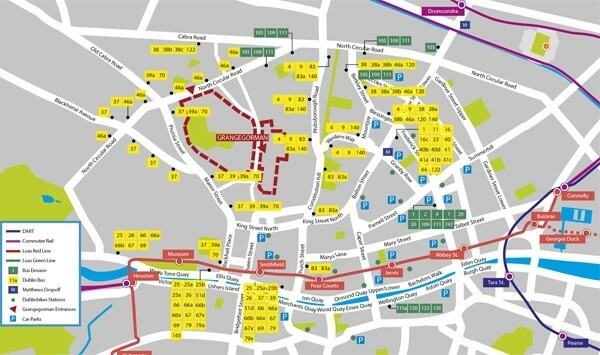 It is also easy to get to the campus via Dublin Bus which have several routes which serve the campus. Some of these will drop you at an entrance to Grangegorman while other stops are just a short walk away. Please see the maps below for more details on both of these options. The bicycle parking facilities at Grangegorman are excellent and there are also lockers, showers and changing facilities available on the campus to encourage cycling commuters. DublinBikes also has a number of bike stations in the vicinity – including Blessington Street, King Street in Smithfield and Parnell Street. The best way to get to Grangegorman is by public transport, bicycle or on foot. 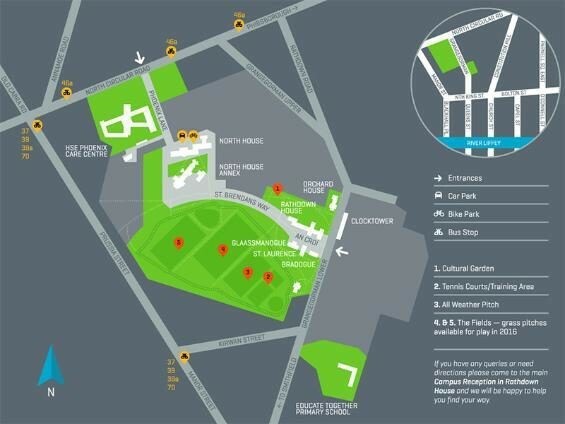 Unfortunately only a very restricted number of car parking spaces are available within the Grangegorman campus as the focus is on linking-in with integrated public transport and environmentally friendly options such as walking and cycling. There are however a number of car parking options nearby. The Graduate School of Creative Arts and Media (GradCAM) is a shared space of structured doctoral studies and research support. The School is a centre for creative research development; a framework for critical interdisciplinary dialogue; and a permeable institution of enquiry that facilitates, promotes and leads the interaction between cultural practice, educational practice and the everyday world of work and innovation beyond the academy. GradCAM is working in close collaboration with the Nordic Artistic Research Network whose members are Glasgow School of Art, Valaand Academy, Luca School of Art, Bergen Arts Academy and Oslo National Academy of the Arts to help realise the Graduate School. The School began operation on February 1st 2008 with an initial intake of nine fully-funded research scholars. Since 2012 the Graduate School has been funded by the DIT and to date 22 students have successfully graduated. There are currently (2017) 15 students fully funded within GradCAM. On 6th February 2018, GradCAM will celebrate its 10 year anniversary. The Dublin School of Creative Arts provides a wide range of innovative, interdisciplinary, and professional level educational and research programmes in visual communications, multimedia design, illustration, interior design, furniture design, product design, painting, scultpture, printmaking, printing technology, print management and publishing. As one of the first departments to relocate to the new Grangegorman campus, the school has striven to transform the location into a genuinely interdisciplinary space for the creation of innovative art and design. The Royal Armouries is the United Kingdom’s national museum of arms and armour, and one of the most important museums of its type in the world. Its collection of about 150,000 items, including our library and archive material, is displayed and housed across its sites, in its historical home in the Tower of London, at its purpose-built museum in Leeds, and at Fort Nelson near Portsmouth. In 2005 the Museum acquired the Pattern Room Collection, started in 1631 by Charles I and enhanced by the British Armed Forces over the years, which is now housed at the Royal Armouries purpose-built National Firearms Centre. The Royal Armouries was established in its present form by the National Heritage Act (1983) and is a Non-Departmental Public Body (NDPB) sponsored by the Department for Culture, Media and Sport. It currently employs 183 staff and receives nearly 2 million visitors a year across the three sites.